This article is about the coffee preparation method and the resulting beverage. For other uses, see Espresso (disambiguation). "Petit noir" redirects here. For French wine grapes also known as Petit noir, see Jurançon (grape) and Négrette. Espresso (/ɛˈsprɛsoʊ/, Italian: [esˈprɛsso]) is coffee of Italian origin, brewed by expressing or forcing a small amount of nearly boiling water under pressure through finely ground coffee beans. Espresso is generally thicker than coffee brewed by other methods, has a higher concentration of suspended and dissolved solids, and has crema on top (a foam with a creamy consistency). As a result of the pressurized brewing process, the flavors and chemicals in a typical cup of espresso are very concentrated. Espresso is also the base for other drinks such as a caffè latte, cappuccino, caffè macchiato, caffè mocha, flat white, or caffè Americano. Espresso has more caffeine per unit volume than most coffee beverages, but because the usual serving size is much smaller, the total caffeine content is less than a mug of standard brewed coffee, contrary to a common belief. Although the actual caffeine content of any coffee drink varies by size, bean origin, roast method and other factors, a typical serving of espresso contains 120 to 170 milligrams of caffeine whereas a typical serving of drip coffee contains 150 to 200mg. Video of how espresso is typically made in the U.S.
Espresso is made by forcing very hot water under high pressure through finely ground compacted coffee. Tamping down the coffee promotes the water's even penetration through the grounds. This process produces an almost syrupy beverage by extracting both solid and dissolved components. The crema is produced by emulsifying the oils in the ground coffee into a colloid, which does not occur in other brewing methods. There is no universal standard defining the process of extracting espresso, but there are several published definitions which attempt to place constraints on the amount and type of ground coffee used, the temperature and pressure of the water, and the rate of extraction. Generally, one uses an espresso machine to make espresso. The act of producing a shot of espresso is often termed "pulling" a shot, originating from lever espresso machines, which require pulling down a handle attached to a spring-loaded piston, forcing hot water through the coffee at high pressure. Today, however, it is more common for the pressure to be generated by an electric pump. Espresso is both a coffee beverage and a brewing method. It is not a specific bean, bean blend, or roast level. Any bean or roasting level can be used to produce authentic espresso. For example, in southern Italy, a darker roast is generally preferred. Farther north, the trend moves toward slightly lighter roasts, while outside Italy a wide range is popular. Angelo Moriondo, from Turin, patented a steam-driven "instantaneous" coffee beverage making device in 1884 (No. 33/256). The device is "almost certainly the first Italian bar machine that controlled the supply of steam and water separately through the coffee" and Moriondo is "certainly one of the earliest discoverers of the expresso [sic] machine, if not the earliest". Unlike true espresso machines, it brewed in bulk, not as individual servings. Seventeen years later, in 1901, Luigi Bezzera, from Milan, came up with a number of improvements to the espresso machine. He patented a number of these, the first of which was applied for on 19 December 1901. It was titled "Innovations in the machinery to prepare and immediately serve coffee beverage" (Patent No. 153/94, 61707, granted on 5 June 1902). In 1903, the patent was bought by Desiderio Pavoni, who founded the La Pavoni company and began to produce the machine industrially (one a day) in a small workshop in Via Parini in Milan. The popularity of espresso developed in various ways; a detailed discussion of the spread of espresso is given in (Morris 2007), which is a source of various statements below. In Italy, the rise of espresso consumption was associated with urbanization, espresso bars providing a place for socializing. Further, coffee prices were controlled by local authorities, provided the coffee was consumed standing up, encouraging the "stand at a bar" culture. In the English-speaking world, espresso became popular, particularly in the form of cappuccino, owing to the tradition of drinking coffee with milk and the exotic appeal of the foam; in the United States, this was more often in the form of lattes, with or without flavored syrups added. The latte is claimed to have been invented in the 1950s by Italian American Lino Meiorin of Caffe Mediterraneum in Berkeley, California, as a long cappuccino, and was then popularized in Seattle, and then nationally and internationally by Seattle-based Starbucks in the late 1980s and 1990s. In the United Kingdom, espresso grew in popularity among youth in the 1950s, who felt more welcome in the coffee shops than in public houses (pubs). Espresso was initially popular, particularly within the Italian diaspora, growing in popularity with tourism to Italy exposing others to espresso, as developed by Eiscafès established by Italians in Germany. Initially, expatriate Italian espresso bars were downmarket venues, serving the working-class Italian diaspora and thus providing appeal to the alternative subculture; this can still be seen in the United States in Italian American neighborhoods, such as Boston's North End, New York's Little Italy, and San Francisco's North Beach. As specialty coffee developed in the 1980s (following earlier developments in the 1970s and even 1960s), an indigenous artisanal coffee culture developed, with espresso instead positioned as an upmarket drink. In the 2010s, coffee culture commentators distinguish large-chain mid-market coffee as "Second Wave Coffee", and upmarket artisanal coffee as "Third Wave Coffee". In the Middle East and Asia, espresso is growing in popularity, with the opening of Western coffee-shop chains. Home espresso machines have increased in popularity with the general rise of interest in espresso. Today, a wide range of home espresso equipment can be found in kitchen and appliance stores, online vendors, and department stores. The first espresso machine for home use was the Gaggia Gilda. Soon afterwards, similar machines such as the Faema Faemina, FE-AR La Peppina and VAM Caravel followed suit in similar form factor and operational principles. These machines still have a small but dedicated share of fans. Until the advent of the first small electrical pump-based espresso machines such as the Gaggia Baby and Quickmill 810, home espresso machines were not widely adopted. In recent years, the increased availability of convenient counter-top fully automatic home espresso makers and pod-based espresso serving systems has increased the quantity of espresso consumed at home. The popularity of home espresso making parallels the increase of home coffee roasting. Some amateurs pursue both home roasting coffee and making espresso. Although some Anglo-American dictionaries simply refer to "pressed-out", "espresso", much like the English word "express", conveys the senses of "just for you" and "quickly", which can be related to the method of espresso preparation. The words express, expres and espresso each have several meanings in English, French and Italian. The first meaning is to do with the idea of "expressing" or squeezing the flavour from the coffee using the pressure of the steam. The second meaning is to do with speed, as in a train. Finally there is the notion of doing something "expressly" for a person ... The first Bezzera and Pavoni espresso machines in 1906 took 45 seconds to make a cup of coffee, one at a time, expressly for you. Modern espresso, using hot water under pressure, as pioneered by Gaggia in the 1940s, was originally called crema caffè, in English "cream coffee", as can be seen on old Gaggia machines, due to the crema. This term is no longer used, though crema caffè and variants (caffè crema, café crema) find occasional use in branding. There is a debate over whether the spelling expresso is incorrect or whether it is an acceptable variant. It is called a less common variant in some sources. Italy uses the term espresso, substituting s for most x letters in Latin-root words; x is not considered part of the standard Italian alphabet. Italian people commonly refer to it simply as caffè (coffee), espresso being the ordinary coffee to order; in Spain, while café expreso is seen as the more "formal" denomination, café solo (alone, without milk) is the usual way to ask for it when at an espresso bar. Some sources state that expresso is an incorrect spelling, including Garner's Modern American Usage. While the 'expresso' spelling is recognized as mainstream usage in some American dictionaries, some cooking websites call the 'x' variant illegitimate. 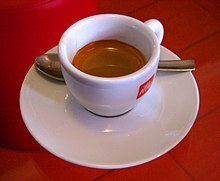 Oxford Dictionaries online states "The spelling "expresso" is not used in the original Italian and is strictly incorrect, although it is common." The Oxford English Dictionary and Merriam-Webster call it a variant spelling. The Online Etymology Dictionary calls "expresso" a variant of "espresso." The Oxford Dictionary of American Usage and Style (2000) describes the spelling expresso as "wrong", and specifies espresso as the only correct form. The third edition of Fowler's Modern English Usage, published by the Oxford University Press in 1996, noted that the form espresso "has entirely driven out the variant expresso (which was presumably invented under the impression that it meant 'fast, express')." A double ristretto with the first half of the shot in the glass at the bottom of the image, and the second half in the glass on the right. The main variables in a shot of espresso are the "size" and "length". This terminology is standardized, but the precise sizes and proportions vary substantially. Cafés may have a standardized shot (size and length), such as "triple ristretto", only varying the number of shots in espresso-based drinks such as lattes, but not changing the extraction – changing between a double and a triple requires changing the filter basket size, while changing between ristretto, normale, and lungo may require changing the grind, which is less easily accommodated in a busy café, as fine tweaking of the grind is a central aspect to consistent quality espresso-making. The size can be a single, double, or triple, using a proportional amount of ground coffee, roughly 7, 14, and 21 grams; correspondingly sized filter baskets are used. The Italian multiplier term doppio is often used for a double, with solo and triplo being more rarely used for singles and triples. The single shot is the traditional shot size, being the maximum that could easily be pulled on a lever machine. 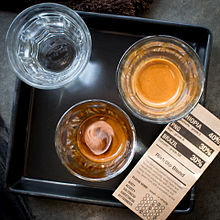 In espresso-based drinks in America, particularly larger milk-based drinks, a drink with three or four shots of espresso will be called a "triple" or "quad", respectively. The length of the shot can be ristretto (or stretto) (reduced), normale/standard (normal), or lungo (long):these may correspond to a smaller or larger drink with the same amount of ground coffee and same level of extraction or to different length of extraction. Proportions vary and the volume (and low density) of crema make volume-based comparisons difficult (precise measurement uses the mass of the drink). Typically ristretto is half the volume of normale, and lungo is double to triple the normale volume. For a double shot, (14 grams of dry coffee), a normale uses about 60 ml of water. A double ristretto, a common form associated with espresso, uses half the amount of water, about 30 ml. Ristretto, normale, and lungo may not simply be the same shot, stopped at different times – which may result in an underextracted shot (if run too short a time) or an overextracted shot (if run too long a time). Rather, the grind is adjusted (finer for ristretto, coarser for lungo) so the target volume is achieved by the time extraction finishes. Cold espresso (espresso freddo) is an alternative form of espresso, mostly served in southern Europe. Conceived in Greece, along with cappuccino freddo in the early 1990s, freddo espresso is in higher demand in Greece and its neighbouring countries during summer. After 2 shots of espresso (usually ristretto) are prepared, the coffee is stirred in a big metal can along with sugar (if desired) and 2–3 ice cubes until the coffee is cold. Then the blend is put in a glass with additional ice. Probably owing to its higher amount of suspended solids than typical coffee which is absent of essential nutrients, espresso has significant contents of the dietary mineral magnesium, the B vitamins niacin and riboflavin, and 212 mg of caffeine per 100 grams of liquid brewed coffee (table). In addition to being served alone, espresso is frequently blended, notably with milk – either steamed (without significant foam), wet foamed ("microfoam"), or dry foamed, and with hot water. Notable milk-based espresso drinks, in order of size, include: macchiato, cappuccino, flat white, and latte; other milk and espresso combinations include latte macchiato, cortado and galão, which are made primarily with steamed milk with little or no foam. Espresso and water combinations include Americano and long black. Other combinations include coffee with espresso, sometimes called "red eye" or "shot in the dark". Flat white: 150 ml, one or two shots (30 or 60 ml), with 1:4 or 2:3 milk, and a small amount (usually 1/4 inch) microfoam. Cappuccino: a very popular frothed milk and espresso drink with no generally-accepted volume standards, but usually served at 120 to 160 ml., including a single or (more commonly) double shot of espresso. Methods of preparation differ between drinks and between baristas. For macchiatos, cappuccino, flat white, and smaller lattes and Americanos, the espresso is brewed into the cup, then the milk or water is poured in. For larger drinks, where a tall glass will not fit under the brew head, the espresso is brewed into a small cup, then poured into the larger cup; for this purpose a demitasse or specialized espresso brew pitcher may be used. This "pouring into an existing glass" is a defining characteristic of the latte macchiato and classic renditions of the red eye. Alternatively, a glass with "existing" water may have espresso brewed into it – to preserve the crema – in the long black. Brewing onto milk is not generally done. ^ Illy, "Il caffè e i cinque sensi" : "La tazzina di porcellana bianca incornicia la çrema: una trama sottile nei toni del nocciola, percorsa da leggere striature rossastre"
^ "The Great Debate: Does Espresso or Drip Coffee Have More Caffeine?". Mr. Coffee. 24 October 2014. Retrieved 21 June 2015. ^ "Show Foods". Archived from the original on 24 November 2013. ^ "Show Foods". Archived from the original on 22 November 2013. ^ "Espresso Tamping". CoffeeResearch.org. Retrieved 8 December 2013. ^ "What is Crema?". seattlecoffeegear. Retrieved 8 June 2013. ^ "Espresso Crema". ChemistryViews.org. Retrieved 8 October 2014. ^ "Today's Espresso Scene". Home Barista. Retrieved 29 April 2011. ^ "Espresso Coffee". Coffee Research Institute. Retrieved 29 April 2011. ^ "L'Espresso Italiano Certificato" (PDF). Istituto Nazionale Espresso Italiano. Retrieved 29 April 2011. ^ "Espresso Italiano Certificato" (PDF). Istituto Nazionale Espresso Italiano. Retrieved 15 February 2013. ^ Illy, Francesco; Illy, Riccardo (1992). The book of coffee : a gourmet's guide (1st American ed.). New York: Abbeville Press. ISBN 978-1558593213. ^ Bersten 1993, p. 105. ^ Stamp, Jimmy. "The Long History of the Espresso Machine". Smithsonian. Retrieved 4 April 2019. ^ "Invention of the Caffe Latte". Caffe Mediterraneum. Retrieved 19 April 2009. ^ Hutchins, Timothy (3 July 2017). Coffee Culture. Lulu.com. ISBN 9781387074518. ^ Bersten 1993, p. 131. ^ Bersten 1993, p. 132-133. ^ "espresso". Oxford English Dictionary. Oxford University press. 1989. Retrieved 30 October 2009. ^ Bersten 1993, p. 99. ^ "Expresso - Define Expresso at Dictionary.com". Dictionary.com. ^ a b Ben Yagoda (18 August 2014). "Espresso or expresso? The x spelling actually has considerable historical precedent". Slate Magazine. ^ Expresso – Definition and More from the Free Merriam-Webster Dictionary. Merriam-webster.com (13 August 2010). Retrieved on 13 February 2011. ^ Expresso | Define Expresso at Dictionary.com. Dictionary.reference.com. Retrieved on 13 February 2011. ^ What is espresso? Or is it expresso?. Homecooking.about.com (14 June 2010). Retrieved on 13 February 2011. ^ What is espresso?, 1st in Coffee explains espresso coffee, Pressure brewed coffee from Italy. 1stincoffee.com. Retrieved on 13 February 2011. ^ "The Great Debate: Espresso vs. Expresso". Espresso Blog. Archived from the original on 16 October 2015. ^ Definition of espresso from Oxford Dictionaries Online. Oxforddictionaries.com. Retrieved on 13 February 2011. ^ "Expresso – Definition of Expresso by Merriam-Webster". ^ Garner 2000, pp. 129–130. ^ Burchfield 1996, p. 286. ^ "Brewing ratios for espresso beverages - Home-Barista.com". ^ Hofmann, Paul (7 August 1983). "Fare of the Country: In Italy, Espresso is the Elixir of Life". Retrieved 25 March 2018. ^ "How To Brew Espresso - Pulling the Perfect Shot". Coffee-Brewing-Methods.com. ^ "The Basics of Making Espresso – Tips and Techniques for Brewing". Retrieved 28 February 2019. ^ "Freddo Espresso & Freddo Cappuccino | Nespresso Hellas". www.nespresso.com. Retrieved 3 December 2016. ^ Kevin, Sinnott (2010). The art and craft of coffee: an enthusiast's guide to selecting, roasting, and brewing exquisite coffee. Beverly, Mass. : Quarry Books. p. 160. ISBN 9781592535637. OCLC 437298903. ^ Ortved, John (29 September 2015). "Is That Cappuccino You're Drinking Really a Cappuccino?". The New York Times. Bersten, Ian (1993). Coffee Floats Tea Sinks: Through History and Technology to a Complete Understanding. Helian Books. ISBN 0-646-09180-8. Burchfield, R. W. (1996). Fowler's Modern English Usage (third ed.). Oxford: Oxford University Press. ISBN 978-0-19-869126-6. Garner, Bryan (2000). The Oxford Dictionary of American Usage and Style. New York: Oxford University Press. ISBN 978-0-19-513508-4. Davids, Kenneth (2013). Coffee: A Guide to Buying, Brewing, and Enjoying (5 ed.). St. Martin's Press. ISBN 1466854421. Dean, Adam (23 May 2006). "The Founding Fathers of Espresso". Whole Latte Love. Archived from the original on 27 December 2012. Illy, Andrea; Viani, Rinantonio. Espresso: The Science of Quality. Academic Press. ISBN 0-12-370371-9. Illy, Francesco; Illy, Riccardo (1989). The Book of Coffee. Milano: Abbeville Press. ISBN 1-55859-321-7.